The date was announced by a cryptic sum "444+4x4x4+(4+4)/4+44/4" which equals 521, or the 21st of the 5th month, but the number four is clearly an important part of the phone&apos;s launch. We&apos;ve previously heard rumors that the Honor 20 will have three rear cameras, but that leak could be incorrect. The hashtag &apos;#capturewonder&apos; does imply an emphasis on photography too, so we shouldn&apos;t be surprised if the Honor 20 does release with four rear cameras. Another possible interpretation of the fours could be that four different smartphones will be launching. Honor&apos;s announcement does reference the &apos;Honor 20 Series&apos; instead of just the Honor 20, implying there will be multiple phones, and we&apos;re already expecting an Honor 20 Pro and Honor 20 Lite, so we could see the flagship and the two differently-sized handsets launching alongside a fourth, possibly 5G, model. 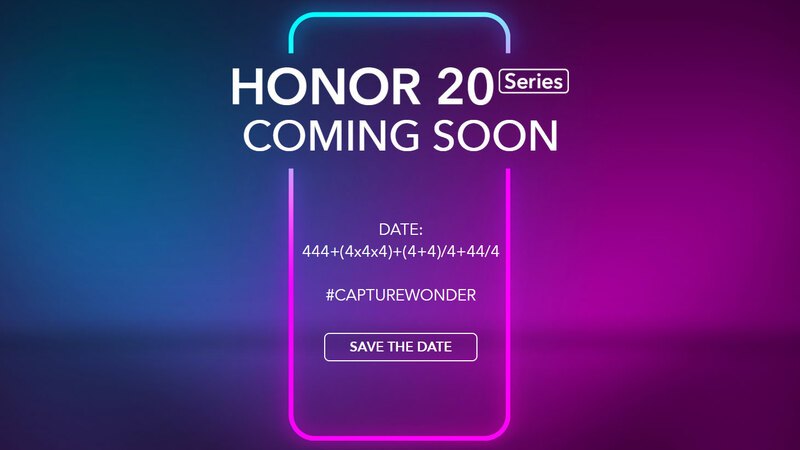 We&apos;ll only know for sure what to expect on may 21, when Honor launches its Honor 20 series of phones, so stay tuned to TechRadar then when we&apos;ll be covering the Honor launch event.